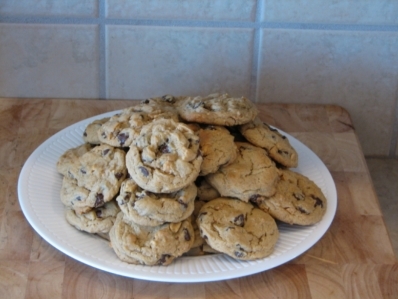 Yesterday I made my first recipe from my new cookie cookbook. It is my first recipe to try out of it so I can’t give a full review of the book yet. But if the other recipes are anything like this one I am going to enjoy this book. We loved these cookies. I love chocolate and my husband loves peanut butter and peanuts so this recipe satisfied both of us. The one thing I changed was leaving the cinnamon out. I thought that would be too many flavors going on. The cookbook says this cookie dough freezes well. I think I will definitely double it and try that next time. I will keep you updated on the cookbook. Whisk together flour, baking soda, salt, and cinnamon in a medium bowl. Put butter and peanut butter in the bowl of an electric mixer fitted with the paddle attachment; mix on medium speed until combined, about 2 minutes. Add sugars; mix 2 minutes. Mix in eggs. Gradually add flour mixture; mix until just combined. Fold in chocolate chips, peanuts, and vanilla with a mixing spoon until well distributed. Refrigerate dough until it is slightly firm, 15 minutes. Roll dough into 1-inch balls. Space balls 2 to 3 inches apart on baking sheets lined with parchment paper. Flatten slightly. Bake until just golden, about 13 minutes. Transfer cookies to wire racks to cool.